It has been a long while. I had family over from Europe and real life got busy. Today I want to talk bout two topics: wet palette and a painter named Jeremie Bonamant Teboul (http://www.jeremiebt.com). Both are interconnected to me as he brought that type of palette to my attention. 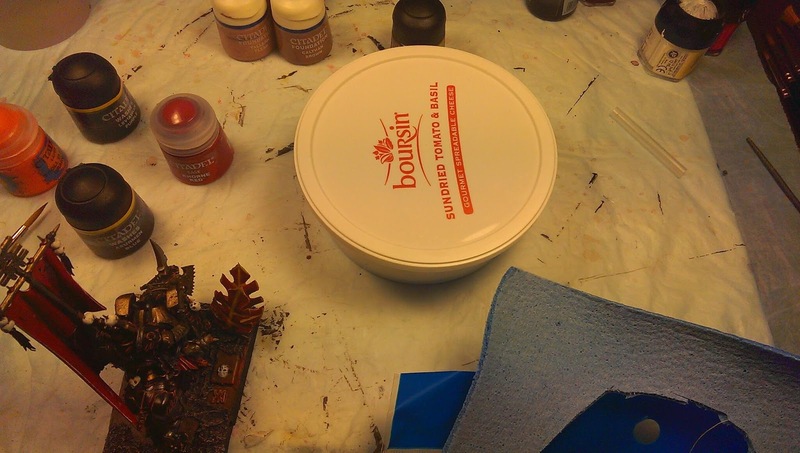 few years backI was looking for tips on painting to improve the quality of my models. I browser different websites and found a guy very active on various painting community. It was Jeremie, i visited his website where he advertised a project he started with few friends in the form of a book that gathered tips and knowledge they acquired over time. Sinece they were all awarded painter I ordered the book and this is were I read about the wet palette. 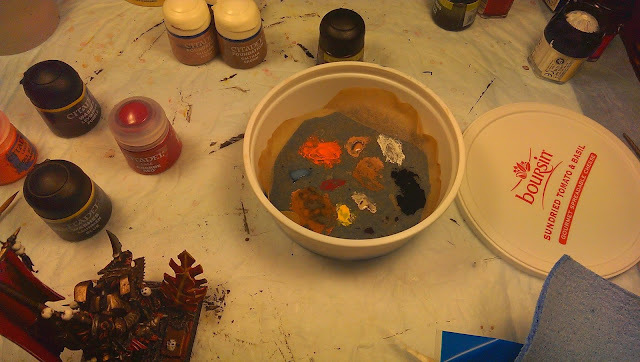 Essentially a wet palette is a wide cup not very deep with a towel soaked in water and a sheet of wax paper on the top. 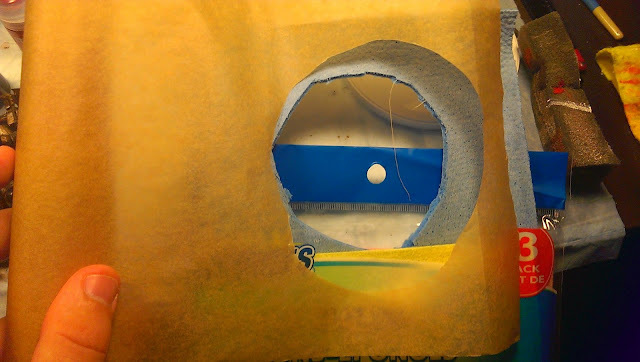 I won't go in the details of the physics behind this little DIY miracle but it hydrates your paint perfectly as the wax paper acts as a semi-permeable barrier and thus allowing little amount of water to filter through it and reach the paint. Mine cost about 2 bucks. 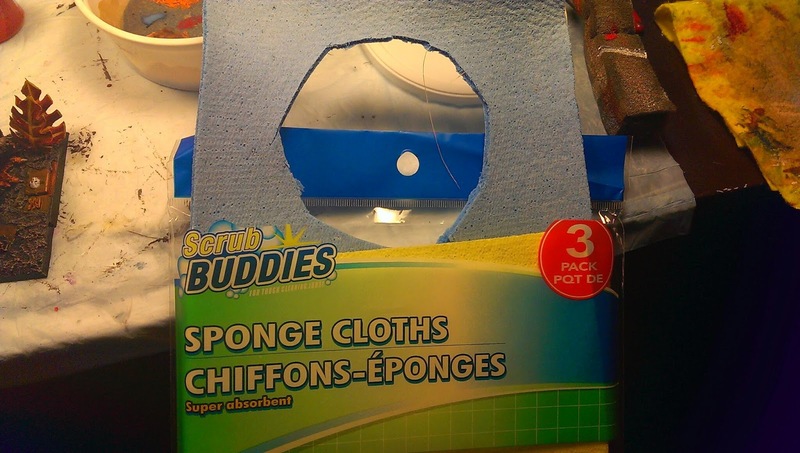 I recycled a flat spread cheese plastic box (being French I had to use a Boursin), bought a pack of spongy towel and a roll of wax paper in a dollar shop and done. See the pictures. I find it handy when you paint a unit or an army to keep some of the dry wax paper as a footprint of your mix and color palette too. I always try new products and tile palette but inevitably I go back to the wet palette as it dilute my paint to this near perfect point, the milky 2% fat point! It is efficient, cheap and very ecological, hence the way to go! Oh yeah! and you can close it to keep your paint fresh overnight. In a cool basement or a fridge. Now let's go back to Jeremie. you may have heard of him recently as he was awarded the prestigious grand prize during Crystal Brush painting competition at Adepticon 2013 in Chicago, IL. Here is a little video by Wilt Chamberlain : http://www.youtube.com/watch?v=-z295YjbSqE. Jeremie produced a DVD few years back and now he is back from 2 years of bike trip with a second DVD on wet blending (with wet palette which is much quicker than with dry retarder) and freehand. Jeremie is a very easy going guy and it shows in its DVD. The main feeling I have when I watch them is that I can get rid of my complexes and fear to f*** my models up and just try new approaches. He shows his model at intermediate steps where it looks not great and shows you how to go back and forth, and even changes tones or light on the go. I do very much encourage you to get your hands on it even though he has an approach orientated to unique piece and diorama, you get a lot of ideas and tips for army painting too. The series on the Minotaur is amaz'balls! You can find few teaser online and I think the best way in the US is through Cool mini or not website: http://www.coolminiornot.com/shop/dvds/painting-miniatures-with-jeremie-bonamant-teboul-volume-ii-painting-in-fresh-and-freehand.html. I helped him for translation purposes but I have no financial interest in the DVD so my thoughts are genuine and honest. I also sent a copy to the Greg and Jen form the PAinting Tabled podcast so feel free to go and listen to their thoughts to compare. That s it for today!.